We had 12 hours to kill in Amsterdam before catching our flight out to Buenos Aires. I still needed a decent set of summer gloves. It was going to be hot heading north to Iguazu, and all I had was my Gore-Tex Rukka gloves. Before leaving the UK I contacted Biker Outfit in Amsterdam to ask about a pair of Rev’it Striker Pro gloves. They had them in stock, so on a rainy Tuesday morning we set off in search of their store. Of course once I got there it turned out they’d sold out of the gloves I wanted and had to settle on a pair of Rev’it Neutron gloves instead, but at least we were able to get out of the rain for while and relax with a drink. As the rain eased we explored the city a little, but as the weather drew cooler we eventually decided to check-in for our flight early and relax at the airport. In fact don’t fly blue and don’t choose KLM as your long haul carrier. We had a number of problems on our flight and have made an official complaint to KLM. Of course over a week later we’ve not heard anything back. Arriving at Ezeiza in Buenos Aires without any cash gave me a chance to use the Travelex Supercard for the first time. It didn’t work. Not at the Citi Bank ATM in the airport, nor the HSBC one either. It wasn’t just my card either. A couple ahead of us were having the same problem. For next 20 minutes we followed each other from cash point to cash point, eventually managing to get our hands on some pesos. Prior to leaving the UK, I booked a small apartment in the Recoleta district via Airbnb. It was a good 45-60 minutes away from the airport by taxi, of over two hours by bus. We chose the taxi and ended up with Carlos as our driver. As it turns out I end up using him again when collecting my bike from the customs a few days later. Great guy, very helpful, chatty, and with a good command of English. With a few days kill until I could collect the bike, Sam and I began to explore the city, starting in our own neighbourhood. Our first stop was Recoleta cemetery and the tomb of Eva Peron. Later we ventured to the commercial centre of Buenos Aires and the famous Oblisco. Our evenings were often spent in the bars and restaurants of Palermo, but we did take time out visit El Ateneo Grand Splendid, a former theatre converted into a book store. The bike was delayed a day while is was being inspected by Canadian Authorities. This gave me time to sort of the cash I needed to pay the customs fees. Or so I thought. Rather than bring thousands of US dollars for the trip. I used a company to Azimo to transfer cash to myself in Buenos Aires. The concept is simple. You give them some GBP and they give you some Pesos at close to the black “blue” market rate. The only hitch was that the Agenper office where I needed to collect the cash closed just as I arrived. That meant waiting another day to get my money, and then collecting the bike the day after. 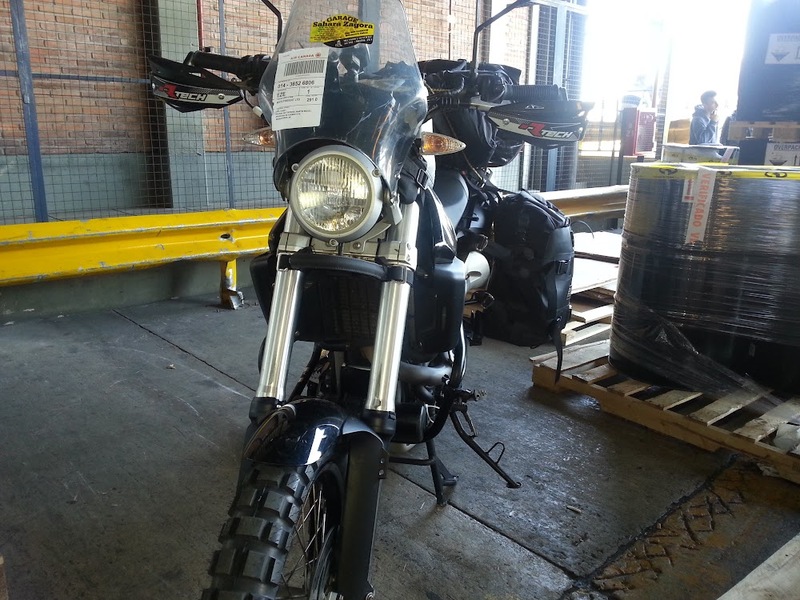 Motofrieght in the UK were handling the crating and shipping of the bike, and Sandra at Dakar Motors was hired to handle the customs process. Both were excellent, and I had the bike cleared in little over three hours. Albeit about £2,000 lighter. With the bike now in my possession we packed our bags and set off for Iguazu. The falls, some of the largest and most spectacular anywhere in the world, were a four day ride away, we were keen to get going before the weather in Buenos Aires took a turn. Our first stop on the road was the Colon, a small town on the border with Uruguay. Just as our taxi driver had said 4 days earlier, leaving Buenos Aires was like entering the 1950s. Still we found a nice little lodge to rest for the night. Though we daren’t use the gas fire for fear of carbon monoxide poisoning. Next up was Paso de los Libres another border town,this time neighbouring Brazil. There wasn’t much to see or do, but after a day’s riding all we wanted was a warm bed and some decent food. The next morning we experienced the first off road section of our trip when the Garmin Sat Nav decided to takes us the scenic route back to the main highway. The only major city along our route to the falls was Posadas. Yet another border town, this time with Paraguay. Initially we though we’d camp here for the night, but as it turned out the address of the campsite was wrong. Instead we went looking for a hostel only to find it had been closed down. After 10 minutes outside contemplating our next move a young women appeared from the hostel and explained that they had no electricity, but we could stay for free if we liked. The offer sounded good to us, but we gave her 100 pesos for her trouble. It’s a shame really as the hostel could have been quite nice if it was all up and running properly. Until this point the road to Iguazu was pretty smooth, wide, and fast. We’d almost have been better off on a large tourer rather than a small lightweight 650cc thumper. After Posadas it was a constant stretch of hills, according to the sat nav we ascended over 7km and descended by a similar amount. As the temperate landscape gave way to tropical style jungle the temperature rose to a sweltering 39c. Finally we’d reached Iguazu.